A Tribute to John Banicki, PE, TEC’s Founder and Chairman Emeritus – Testing Engineers & Consultants, inc. It is with heavy hearts that we announce the passing of our Founder John Banicki, Jr. on April 3, 2019. He was born in Detroit to the late Anastasia and John Banicki, Sr. Mr. Banicki is survived by his wife of 48 years, Katherine, four children, five grandchildren and two great grandchildren. He is preceded in death by his parents and his sister Adele Andrews. 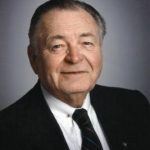 John Banicki, PE, was the Founder and Chairman Emeritus of Testing Engineers & Consultants, Inc. (TEC) made many contributions to the engineering community. However, John felt that his most significant contribution to the community and to society in general, was his enlistment and service as a Naval Aviator in the US Navy in WW II, where he served as a Lieutenant in the Pacific Operations. Mr. Banicki was very proud of his Veteran status as evidenced by the wearing of his WW II Naval cap right up til the day we said goodbye. After serving as a pilot and spending many months on the U.S.S. Onslow aircraft carrier, John “wanted to keep both feet on the ground for a while” so, he returned to Wayne State University and pursued a profession in civil engineering. What followed was an engineering career that spanned 50+ years. During that time he was directly involved in the construction of a multitude of Michigan landmarks including the Ford Auditorium, Book Cadillac Hotel, Detroit Renaissance Center, Lafayette Park, and the Detroit People Mover. In 1966, he and his wife Katherine founded TEC setting the tone for many years to come as a family-owned business. Today, TEC is a multi-million dollar engineering consulting firm. John was active in many professional trade organizations such as AIA Michigan (honorary member), AGC Michigan, the Michigan Society of Professional Engineers (MSPE), and the National Society of Professional Engineers. John received many awards for engineering excellence and distinguished service including the MSPE Engineer of the Year Award in 1979, as well as his induction into the Engineering Hall of Fame at Wayne State University. His commitment to the profession is demonstrated not only by the organizations he worked for, but also by the individual people he helped along the way. He developed a tutoring program for young Polish engineers and continues to sponsor an annual engineering scholarship at WSU. Along with his passion for his family, Country, and engineering was music. His love for the trumpet was apparent during his naval career when he played reveille to wake up the troops. He continued his musical career playing with the house band for WXYZ Radio, which included playing on the Lone Ranger Show when it aired. And, if you were at an event where there was a piano to be played, that’s where you would find John. He was quite the entertainer and would fill the room with his laughter and music. His presence will be greatly missed.